Global Dolphin Energy Healing Tele-Circle! We feel so enormously blessed by the gifts of love, joy, peace, and serenity the dolphins have given to us. In light of all that is going on on the planet at this time, we feel moved to share the beautiful healing frequencies of the dolphins with all who wish to receive, on a weekly basis, free of charge. If this small amount of our time and energy helps to lift you up, it is time and energy well spent. Every Thursday, David or Linda hosts a free 20-minute dolphin energy healing for anyone, anywhere, who wants to receive it! During this time, we share the beautiful healing frequencies of the dolphins with everyone participating. The Tele-circle is a great way to introduce yourself to Dolphin Energy. If you're already familiar with Dolphin Energy, it’s a great way to receive a loving splash of Dolphin Love and Joy to carry you through your week! Come on in! The water’s great! We open the call at 11:55am Pacific Time for sharing, connection, and questions. We have a lot of fun together! To determine what time this is where you live, click on this link. The healing transmission begins a few minutes after Noon Pacific Time. It's fine to call in anytime between 11:55 and noon. Option 1: You can call in to the conference call and participate in my live, guided lead-in to the session. For the benefit of our international friends, our conferencing service provides local phone numbers in more than 70 other countries. If you're outside the U.S., click on this link, then click on View List to see if there's a local number in your country. The list shows the country code for each phone number, as if you were calling from outside that country. 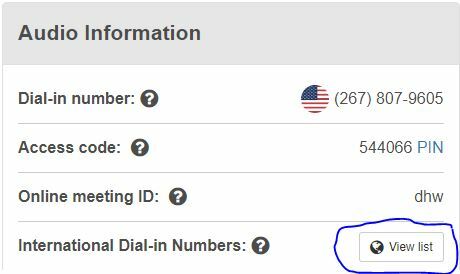 Put your cursor over the phone number, and you'll see the correct way to dial the number from inside your country. Option 2. If it's not convenient for you to be on the call, you can simply tune in energetically, at the scheduled time, and open yourself to receive. And if this particular time or day does not work for you, you can still receive this gift. The dolphins have the ability to bend time! At the time that's convenient for you, ask them to connect you to the "pod" of receivers for the week, and then trust that you're connected! If you click on this link, it will play on your computer. You can also right-click on the link (ctrl-click if you have a Mac) and choose "Save As" to save the MP3 file to your computer, so you can copy it to your MP3 player or burn it to a CD.